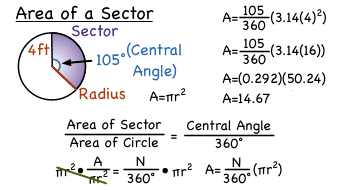 A sector is just a fraction of the area of a circle. Did you know that there's a formula to help you find the area of a sector? In this tutorial, you'll learn how to find that formula! Take a look! Trying to find the area of a sector of a circle? Then check out this tutorial! You'll see how to use given information and the formula for the area of a sector to find the answer. Take a look!